Progress on the 24-H.96 Bridge Replacement Project continues. This week, construction crews worked on the new bridge deck for 24 Rd., south of I Road. 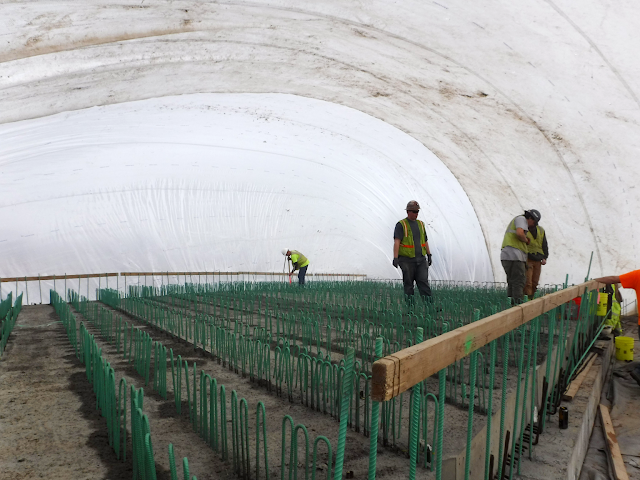 Pictured above, the deck is covered with a plastic tent filled with warm air so that the concrete can cure properly. It also provides warmer conditions for workers while its below freezing outside. The project will include the construction of a new bridge over the Grand Valley Irrigation Canal, irrigation modifications, and road profile improvements. Additionally, there will be a reconstruction of the intersection at 24 Road and I Road to improve the sight distance. The anticipated completion date of this project is the beginning of May 2019. 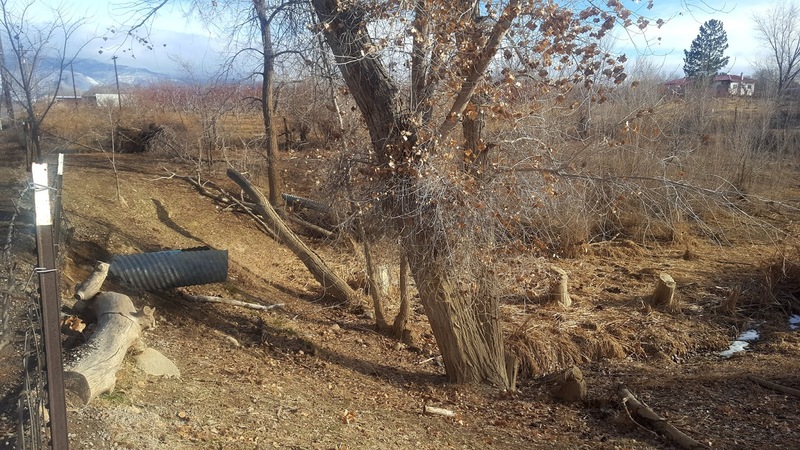 Mesa County received a grant from the Department of Local Affairs (DOLA) for this project. Road safety improvement construction on Kimball Creek Road and the intersections of 59.9 Road and 58.7 Road continues. 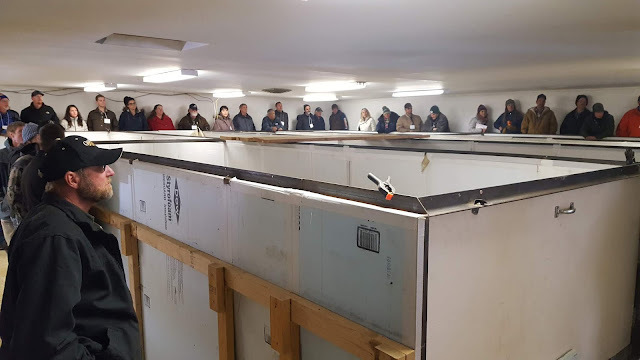 The project got underway in November 2018. This is a full depth reconstruction road project to address safety issues along Kimball Creek (58.6) Road on the north side of the Town of Collbran from the intersection of Buzzard Creek (58.9) Road to the intersection of 58.7 Road. Work continues on the improvements to Kimball Creek Road in Collbran with the installation of new walls. The Board of Mesa County Commissioners proclaimed January 20 through 26, 2019, as School Choice Week in Mesa County and call this observance to the attention of all citizens. Mesa County recognizes the important role that an effective education plays in preparing all students in the Grand Valley to be successful adults. School Choice Week is celebrated across the country by millions of students, parents, educators, schools and organizations to raise awareness of the need for effective educational options. Pictured above from left to right: Commissioner John Justman, Head of Caprock Academy Andrew Collins, Commissioners Rose Pugliese and Commissioner Scott McInnis. Mesa County Commissioners proclaimed January 2019, as National Crime Stoppers Awareness Month and called upon residents to join Crime Stoppers of Mesa County to help prevent crime. Read more at https://bit.ly/2FFmvXr. Mesa County Commissioner John Justman was appointed to fill a vacancy on the Grand Valley Drainage District Board of Directors (GVDD) this week. Cody Davis resigned his position as the Division #1 Director on the Grand Valley Drainage District Board of Directors effective January 10, 2019. Pursuant to C.R.S.Section 37-31-125, in the case of a vacancy in the Board of Directors, the Mesa County Board of County Commissioners shall appoint a director who shall hold office until the next regular GVDD election, and a successor is elected and qualified. Commissioners Scott McInnis and Rose Pugliese voted to appoint Commissioner Justman at an administrative public hearing where the public was asked to weigh in. Mesa County Commissioner Scott McInnis (pictured here) spoke to Daily Sentinel Reporter Erin McIntire about the Board's decision to appoint Abby Landmeier to the library board. Read the article at https://bit.ly/2ANX56D. 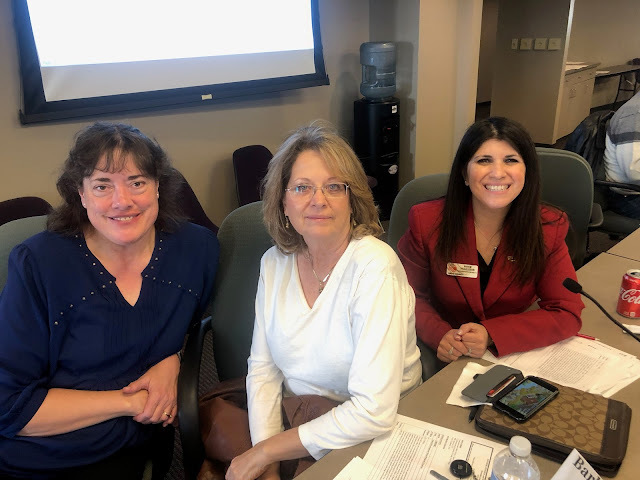 Mesa County Commissioner Rose Pugliese attends Colorado Counties, Inc., legislative meeting and discusses bills coming down the pike that affect local government with newly elected El Paso Commissioner Holly Williams and Weld County Commissioner Barbara Kirkmeyer. Mesa County Treasurer Sheila Reiner (right) and Chief Deputy Treasurer Jackie Campbell share that paper tax bills will go out late this week. Earlier this week, e-statements were sent out. Anyone who applied to get their tax statement via e-mail should have it in their inbox by now. If you would like your tax notice electronically, next year follow the instructions on the paper bill or e-mail the Treasurer's Office at mctreas@mesacounty.us. Accounting Specialist Heike Buenning helps a resident with his property tax payment Thursday afternoon. Accounting Administrator Amy Bosse reconciles daily deposits. Accounting Specialist Chris Horner takes in daily deposits from various county departments and verifies that they balance. Ben Mendenhall, Vice President of Investment Advisory Services and Cory Gebel, Director of Portfolio Management of Public Trust Advisors came to review Mesa County's portfolio with Mesa County Treasurer Sheila Reiner and Chief Deputy Treasurer Jackie Campbell. Part of the Treasurer's statutory duties is to make investment decisions for the county's funds. The state statute is pretty restrictive on which public funds can be invested in so there is not a great amount of risk involved, but there is some strategy to it! Mesa County Coroner Victor Yahn rearranges office space to welcome a new investigator to his team. Acting Criminal Justice Services Director Matt Sullivan (left) recognizes Community Corrections Board Member at Large, Sharon Walker. 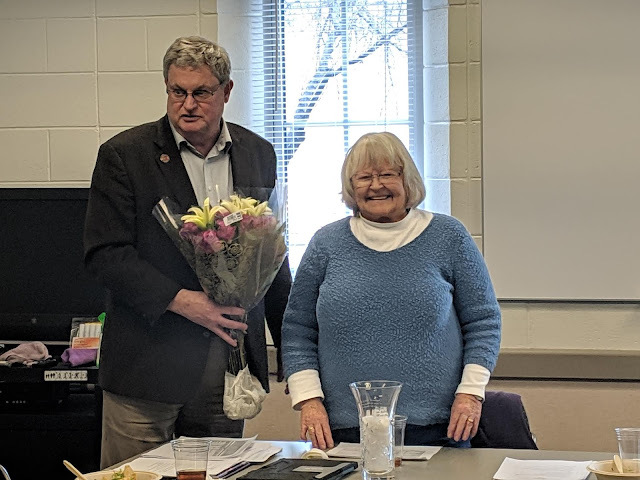 Sharon has served as a board member for the past 14 years and was recently honored for her contributions to our community and her work on statewide community correction board issues. 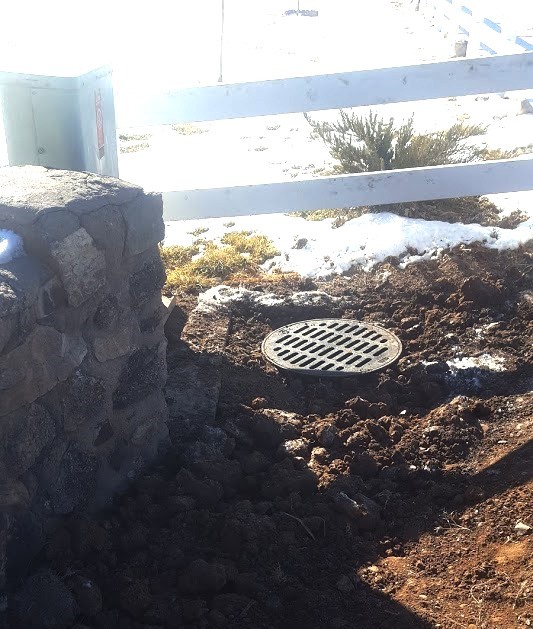 A new outlet structure was installed on 20 1/2 Road and Terrace Ct. to alleviate drainage issues in the area. Here is a photograph of a completed project by Road and Bridge Construction Team. Thanks, Scott, Mark, and Travis for your hard work! 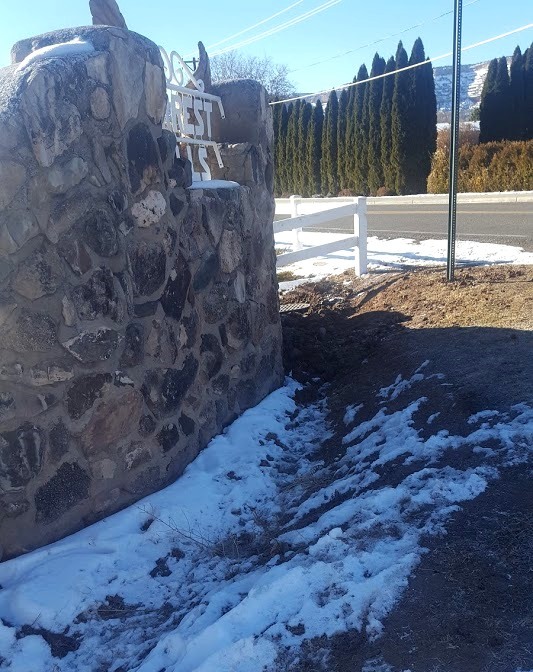 This outlet structure was installed on 20 1/2 Road and Terrace Ct. as part of a drainage complaint that Mesa County responded to. This week, a drainage complaint was handled by Road and Bridge Construction Team to help with flooding issues. An overflow pipe was installed around C 1/2 and 34 roads because during severe rain events floodwaters overtopped the road, and it creates a hazard for travelers. Improvements will keep the road from being closed down for safety reasons. The pipe is wrapped in CMP to keep the ends of the pipe safe during burn season. Brant Harrison (left), a member of the Upper Grand Valley Pest Control District Advisory Committee and owner of Kokopelli Farms listens to an explanation of a drying system used to process hops and hemp during part of the Western Colorado Horticultural Society annual conference and bus tour. 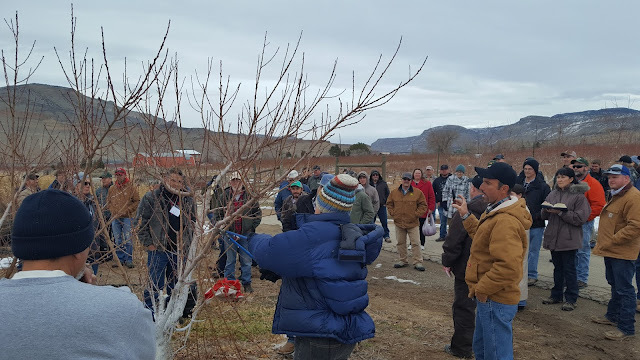 Bruce Talbott (center), a member of the Upper Grand Valley Pest Control District Advisory Committee explains his different methods of tree pruning to maximize productivity and minimize labor to the crowd of fruit growers during the Western Colorado Horticultural Society annual conference and bus tour. Western Colorado Horticultural Society bus tour attendees try their hand at different pruning methods. 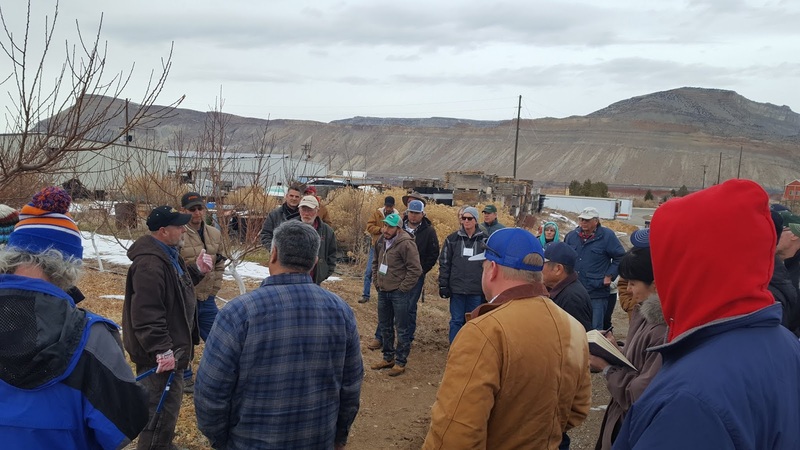 This is the 76th year for the WCHS conference which brings new and experienced fruit growers from Colorado and other western states together to learn from the latest research, share success stories, and keep finding ways to improve their craft. 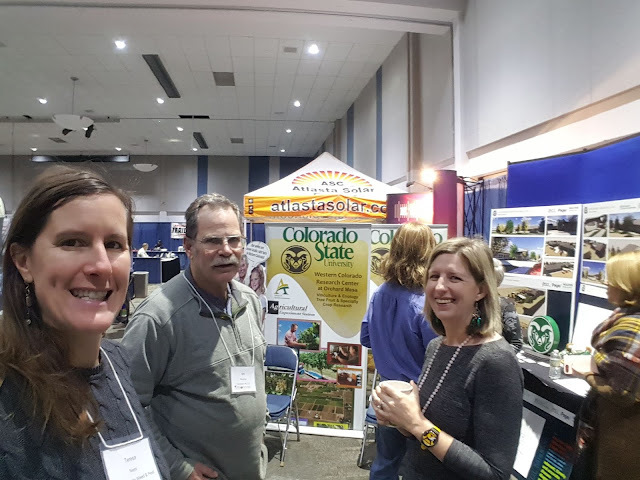 Teresa Nees with Mesa County Weed & Pest (left); Bob Hammon, former CSU Extension Entomologist, and current UGVPCD Advisory Committee member; and Meredith Shrader, current CSU Extension Entomologist at the Western Colorado Horticultural Society annual conference at Two Rivers Convention Center. 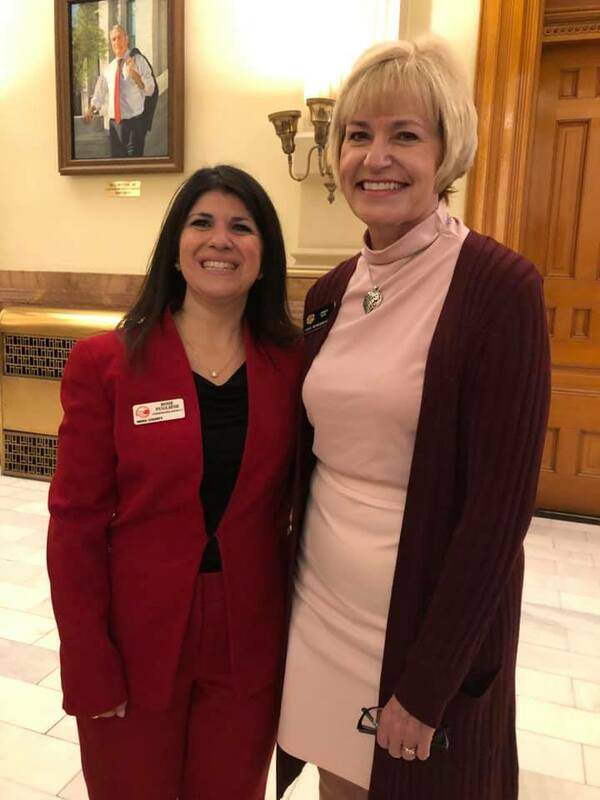 Mesa County Commissioner Rose Pugliese (left) and Colorado State Representative for House District 55 Janice Rich are working on HB19-1062, concerning the Grand Junction regional center campus. For more information on the bill, visit http://leg.colorado.gov/bills/hb19-1062. 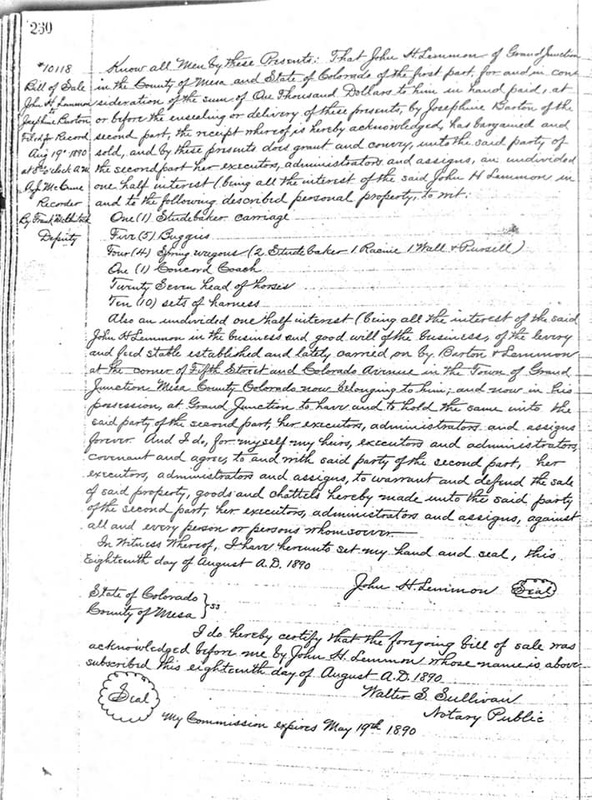 From the Mesa County archives: Bill of sale recorded by the Mesa County Clerk’s Office on August 19, 1890. 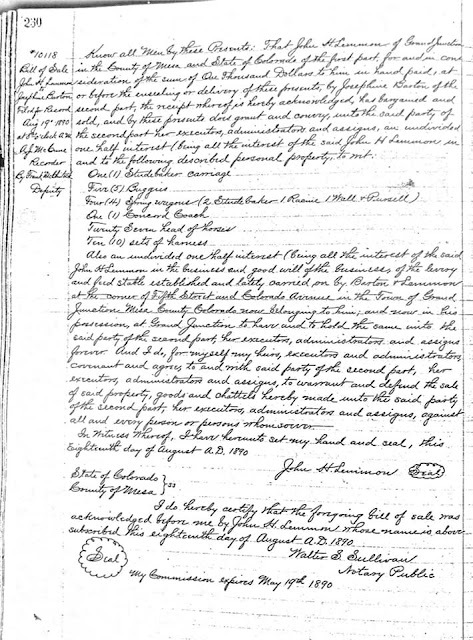 John H. Lemmon sold to Josephine Barton: one Studebaker Carriage, five buggies, four spring wagons, one Concord Coach, 27 head of horses, 10 sets of harnesses and one-half interest in the Levy and Feed Stable Establishment. Price paid $1,000.00. Got a New Year's resolution to help our community? Become a Victim's Advocate! Volunteers provide comfort and compassion to victims of crime. Don't have any experience? They will train you! 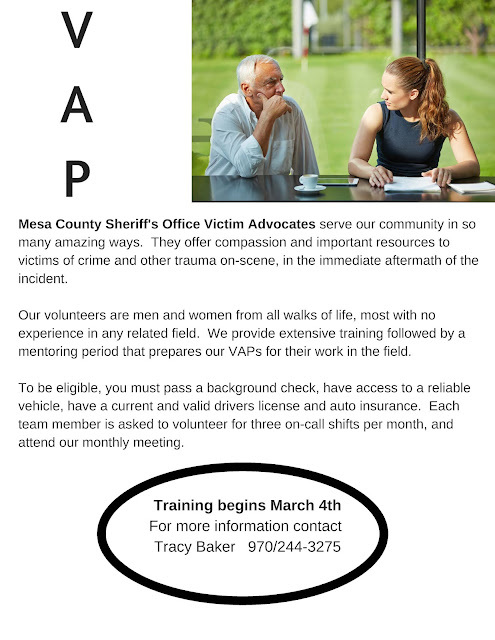 Learn more at https://sheriff.mesacounty.us/vap/. If you are interested in becoming a member of the Victim Advocate Program, just fill out an application or contact the Mesa County Sheriff's Office Victim Advocate Coordinator. See the attached flyer for more information. Mesa County administrative offices will be closed Monday, Jan. 21, 2019, in observance of Martin Luther King Jr. Day. 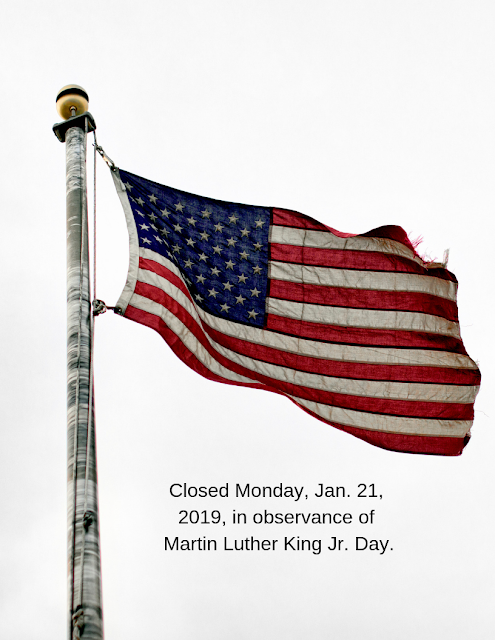 The holiday closure does not include the Coroner’s Office, Criminal Justice Services, Grand Valley Transit (GVT), Mesa County Landfill or the emergency functions of the Sheriff’s Office. Animal Services (971A Coffman Road) will be open from 11 a.m. - 1 p.m. For a list of closures, visit https://bit.ly/2ssOJwU.